Option 1: Attach the upper Quick Stick™ tabs by tucking them under the harness attachment wings. See IMAGE 1. Attach the lower Quick Stick™ tabs as normal. See IMAGE 2. Option 2: Separate the Harness Frame from the Inner Shell according to the manufacturer’s instructions. 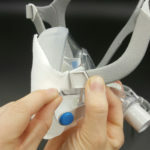 Attach the Quick Stick™ tabs of the Silent Night liner to the Inner Shell as shown in IMAGE 3. Reassemble the Harness Frame and Inner Shell according to the manufacturer’s instructions. See IMAGE 2. With either Option be careful to not damage your mask. Pursue Option 2 at your own risk. 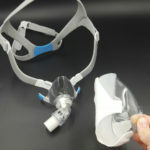 Although these parts are designed to be separated and reconnected, improper or repeated disassembly and reassembly could cause the parts to wear out or break. 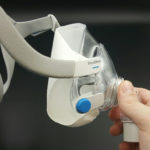 ResMed Quattro Air Mask – Where do I attach the Quick Stick™ tabs?